These adorable Felt book marks are a must for any book reader. They make wonderful presents and can be made and personalised in different colours using different motifs and accessories. For simple and easy step by step instructions on how to make these book marks watch the video below. 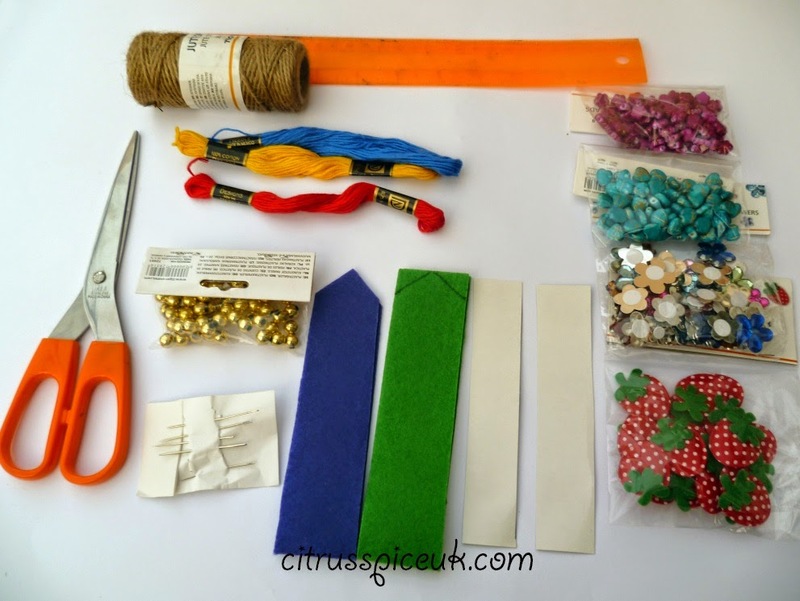 NB-This craft activity is suitable for children if carried out under adult supervision. This is a really great tutorial, and these bookmarks are really cute! Cute! I like that you've presented the instructions as a video. Thanks Sarah, I thought it would be more fun this way. I hope Casey enjoys making these in Easter holidays. Great activity for kids although may need little supervision when using needle. What a sweet project - great tutorial! Thanks for sharing. These are adorable! Great video tutorial. Great tutorial! Good way for me to stop dog-earing my pages when I'm reading! These are lovely. A great tutorial too. They look lovely and a nice gift to give too. Its nice for kids to make things to gift. That strawberry one is adorable! Great tutorial and great ideas for making gifts. Great video! May try it to make gifts for next Christmas. They make great gifts you can add little snowman, holly or christmas puddings for decoration on christams theme. Fabulous! Great video and what a lovely simple idea. Those accessories are gorgeous. Must investigate some crafts shops now! Hobby craft, Tiger and Poundshop seem to have a lot of these craft making accessories. Soo cute! And easy too. These are SO cute Nayna! So fess up which one is your favourite? I like the one with the strawberry. My all time Favourite. Halima I hope you have fun creating them and putting your scraps to good use. This would be fun for older children. Simple directions. nice video. Alana visiting from UBC. I made these with my nieces so reliving the time I had when my daughters used to do arts and crafts. Very cute bookmarks! Thanks for sharing the tutorial! Great idea Lisa anything to keep the kids occupied in the holidays. Great project. Looks like a fun one to do with my children. Thanks for sharing! 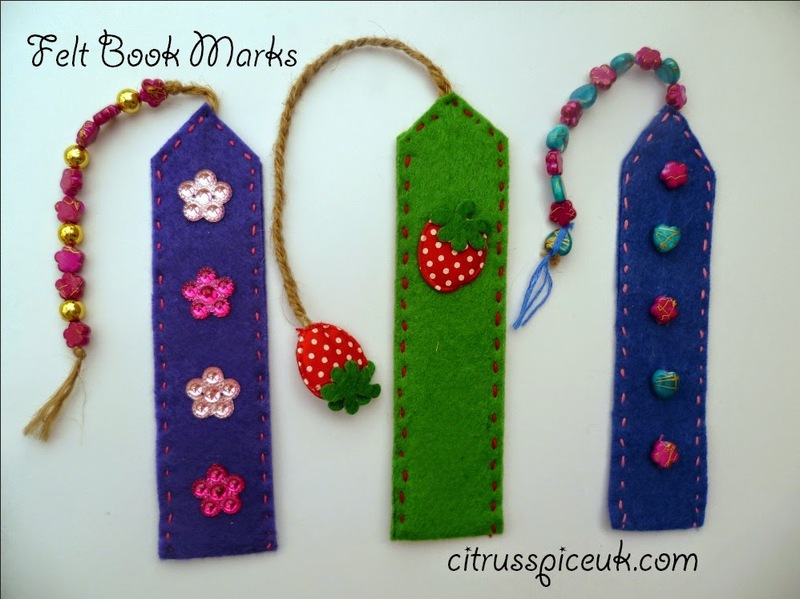 What great bookmarks, our 7 year old would love making them and having them! Me too but now I make them with my nieces and nephews. Wow, they do look beautiful. Neat way to make bookmarks. Have done this in the past. These are lovely. It's years since I worked with felt - I think I was a kid myself and had those Fuzzy Felt shapes that you stuck on felt boards last time I used it. That takes me back! Terrific bookmarks. I'm all for anything that helps a person read. Great article and project mt my Tween and I can enjoy together! I hope you enjoy the craft session. Lovely project to get children interested in crafts. You are very talented Nayna. These bookmarks look amazing. I made one yesterday! So easy and it looks lovely! So proud! Tracy that's so lovely that you made these. This is a really neat craft! I love these! I sell children's books and run craft sessions to tie in - I think these will be making an appearance soon! They look so pretty. I'm rubbish at anything crafty. Very creative .. they look so pretty. Nothing like giving a hand made gift to friends. These would make adorable presents for my little boys dad and granddad, We'll be able to use some of my miles of fabric!!! Ooh, just what I was looking for. Thank you.